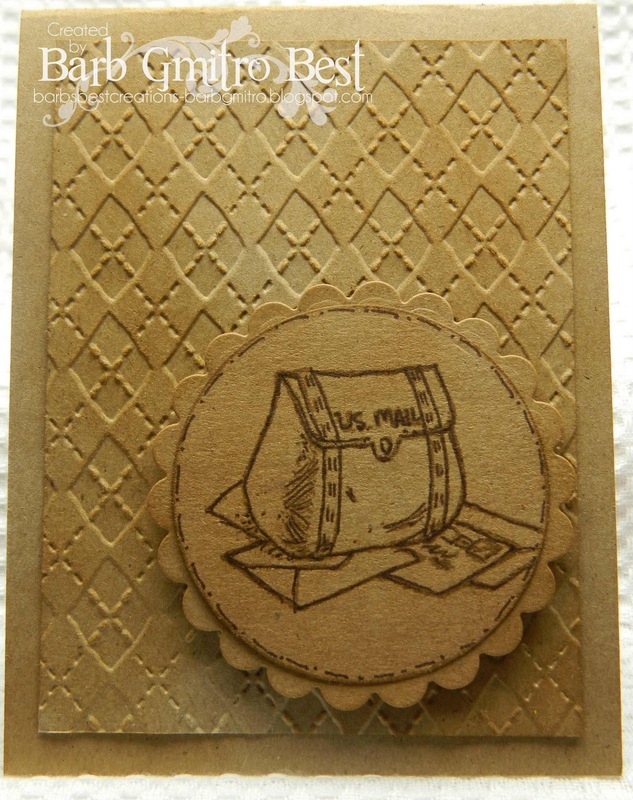 I LOVE the clean and simple style and always try use this look when I am mailing cards. 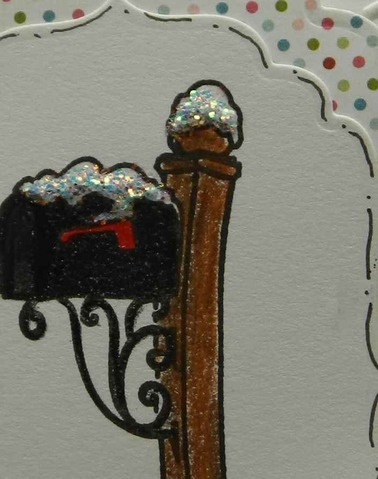 I don't want the card to get ruined by embellishments that poke out. No matter how hard I try the card never stays the same! 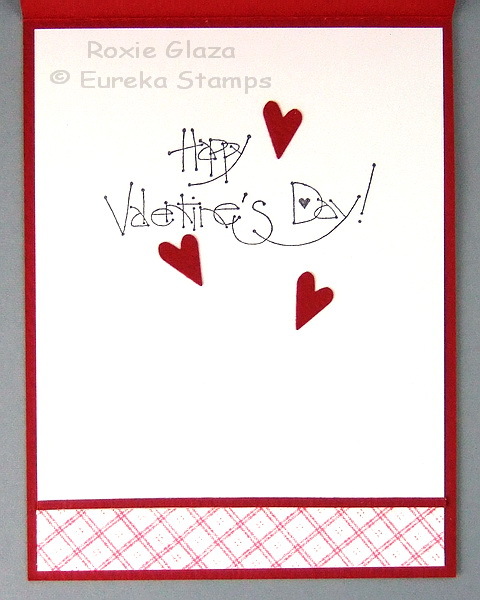 I have used the Eureka Stamp that is titled Hearts Flower Border. I then used a rub-on from my scrap bin so I could fittingly send it to my friend. 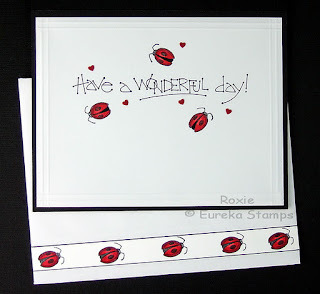 Now if you haven't - please go on over to Eureka Stamps now and check them out! 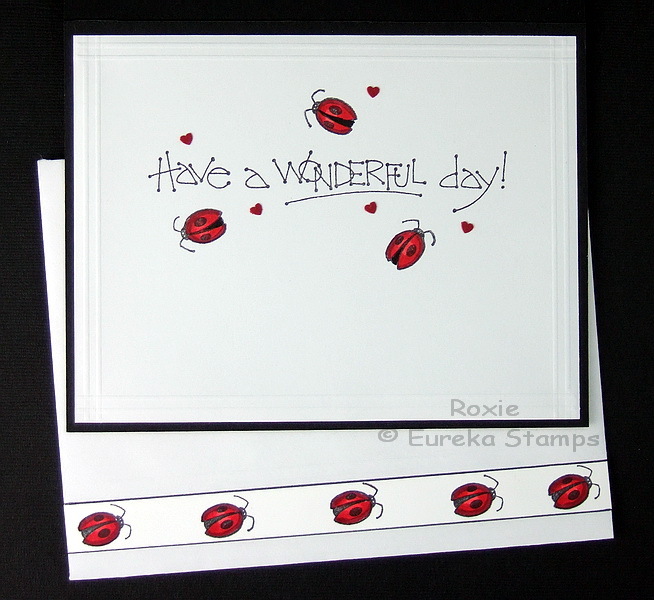 Hi there it's Ceal again with another Eureka Stamps card. For this card I used 20801 Butterfly and Sunflowers. It is part of the Tender Thoughts collection. I love, love, love this stamps. It is so fun to color and makes a beautiful card. 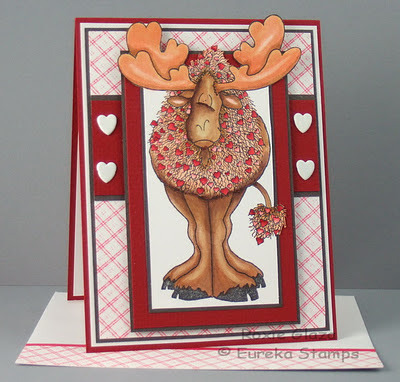 Eureka Stamps has a quite a few big moose images and I find them not only amusing to look at but fun to color. I used Copic markers to color this one. I used the Perfect Layers tools from PerfectPaper Crafting to cut the even layers and the Perfect Square works great for the out of the box image. After cutting the out of the box image I used a Marvy black marker to color the very edge of the cardstock. Stampin Up mat pack and Bazzill piercer were used to place the brad holes. I believe the brads are from Darcie, but not positive. On the insert I cut a strip of designer paper and about a 1/8" strip of cardstock and glued them to the paper with Aleene's tacky glue. I did the same for the envelope but cut red paper in place of cardstock. I used an EK Success punch for the hearts and also glued them on. Today I have a little "Hogs & Kisses" card to show you. Pigs in Love (#2702) from QKR Stampede. I used to be a pig collector, years ago, we had pigs of all sizes in every room of our house. Since that time, I've changed my style and now I, pretty much, only stamp pigs. I thought this couple were adorable and they are a quick and easy image to color. I stamped onto water color paper and used water color crayons to color them. I hand printed the sentiment. I think this would make an adorable Valentine for my hubby! and see all the wonderful versatile images they have to offer. Stop back soon and see what else our team is up to. use the stamp Winter Bear. I used a simple design for this card. I wanted to really spotlight the image. really helps to pop the colors out. Hello all! It's Kristie sharing today. I have always loved when I see cards made with pages from old books and I have a couple books that I keep just for that purpose. I used the Lg Patriotic Star (#11603) from Eureka! Stamps to make this card. I tore a page out of an old book and stamped the star image randomly all over the page with red Distress Ink. 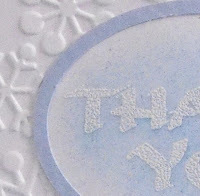 I then used clear embossing powder to heat emboss the images. As you can see I layered a couple layers onto a red card base to give a bit of dimension. For the inside I randomly stamped onto another page from the book with red Distress Ink. I used my computer to print the sentiment onto white paper, then used a bit of Antique Linen Distress Ink to tone down the bright white of the paper. I stamped a star into the center of the sentiment. I didn't want the star to overpower the sentiment, so I stamped it onto scrap paper and then onto the sentiment. I think this card could be used for Valentine's Day, as a congratulations card, or for anytime you just want to let someone know you care or are proud of them. There are many wonderful image in the Eureka! Stamps Store that can be used for a lot of different occasions, just try to think outside the box and use your imagination. Thanks for stopping by today. I hope you will leave a comment and come back again soon. Because of the college classes I'm taking, I tried to get a good head start on cardmaking this year, and had today's card finished a week or two ago. However, as is very typical for me, I suddenly remembered a family birthday - my husband's - is today! It's almost a family joke how I tend to forget my own family member's birthday cards until last minute! So Saturday morning found me hastily making a card while my husband shoveled the driveway! Bruce is not really into cards, but some time ago he saw me with a stack of notecards I was beginning to color in, and he requested I make one for him to give someone ... but he liked the black and white, and asked me to put just the smallest dash of red somewhere on the card, and leave the rest without color. Remembering that, I decided to make him a card with the same color scheme, though I did use some grey as well. I used the plaid stripes (second row) and the happy birthday for a simple, masculine look. Hello! This is Jessica B. here today with a card for OKR Stampede. If you haven't checked them out recently please do so..you will find adorable images to suit any card or project you need! 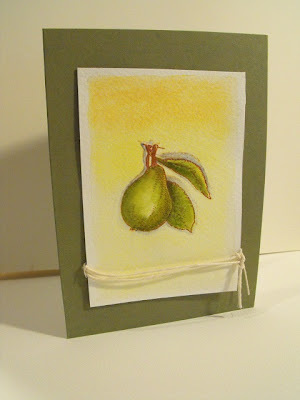 I chose this cute , detailed pear for my card today. It stamps really well and just as detailed as it looks on the computer! I stamped it in Archival sepia then water colored the whole thing with water colors and water color pencils. Then I tied some hemp twin around the image and adhered it to a premade card base. You can't get much easier than that can you? Go check out the store and please come back to the blog often to see what the other talented design team members have to show you! It's Ceal to share another Biblical Impressions card with you. 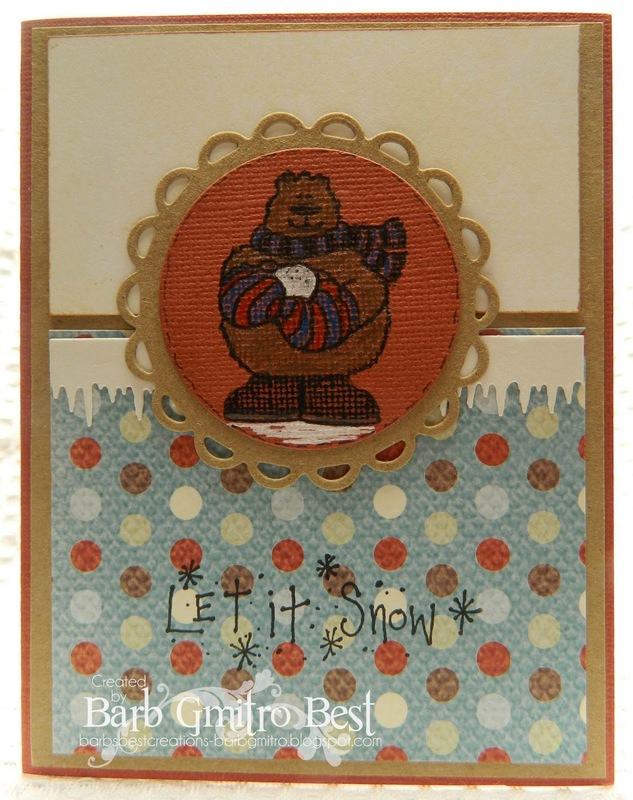 For my card I used two different stamps, 84207 Patchwork Glove and 32603 Snow Swirl. To make my background I stamped the Snow Swirl with Versamark ink added some sticky powder and heated it before adding my embossing powder. I then colored my image with Copic markers and masked it so I could sponge my background with distress inks. Have you visited them yet today? Their scripture stamps are awesome and I love to use them in CAS cards espcially! some scraps, a prima, and a button. Can't get much more simple than that! Can you tell I love verse stamps and CAS cards? Please note: It seems some of us are having problems with our blog hosts, some of the links are leading to a white page, some blogs can't see to be commented on and some posts just aren't posting. Please continue through our hop, we are each trying to get things up and running properly. If you find a link that isn't working, be sure to come back here to hop on to the next person on the hop. The line up is listed below. Sorry for these problems and thanks for your patience! 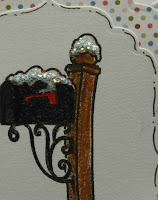 Welcome to the first QKR Stampede Blog Hop for 2012! This is also the first hop for our new design team. I'm sure you will get to know these ladies and their style over the next 6 months. but we also have some new ladies on our team. Here's a little sneak peak of what you will find on the hop. So let's get started. If any of the links don't work or you get "lost" along the way, just hop on back to this page and you can get back on track. Once you have hopped through all the blogs listed, let us know what you thought of our hop and our new team. Why not hop over to the QKR Stampede shop and picking out some great stamps to work with. Once you do that, create something, come back and comment on a post and leave a link to your project. I have another CAS card to share with you today! I tend to keep some of my birthday cards very simple, especially ones that I am sending to those who are int he hospital or are elderly, or overseas. I do it for postage reasons and for the fun of simplicity. I always make sure to use a really thick card stock when I make my cards this simple. and on the inside I used the sentiment titled I Wish You Love which you can get in rubber or digital! Can't we all use some of that at times? HI! This is Jessica B. here today with a post for Biblical Impressions. 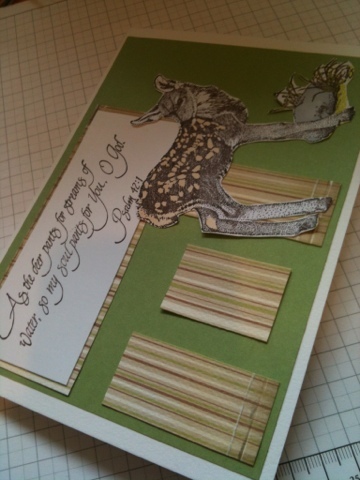 What a fun card this was to make! This one is bound for my father for his birthday. I think he will like it as much as I do. If you haven't checked out the store in a while , please do so! There are many fantastic images you can use to create scenes just like this! Isn't that pretty? I used this fantastic Schooner stamp , plus this for the tree line in the back ground and this stamp for the rocks in the foreground. To start off I stamped the ship on scrap copy paper and cut it out to make the mask. Then stamped it on the actual piece of paper i was using, covered it with the mask then stamped the trees. I drew a faint horizon line then stamped the rocks in the beachy area. I turned the stamp catty cornered to do the "curve" of the shoreline. Then I colored it all with Prismacolor colored pencils and OMS. Matted it to a dark grey paper....then to the card base..and viloa'..I am super happy with how this turned out! That's is for me today! Hope you are having a fantastic day..please check back often as the other Design Team members are sure to have more creations to please! HI! 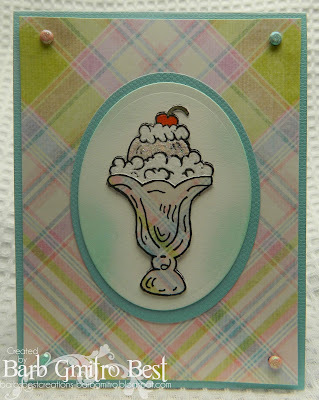 Jessica B, here with a fantastic stamp from Eureka Stamps.. I love butterflies and when I saw this beauty I couldn't wait to ink it up. I knew it would be a lot of fun to color and it didn't disappoint! Ok, I have to admit that once I did ink this up it was a bit intimidating LOL. I decided to use an over all color scheme which was yellow, red, and orange for all but one of the butterflies. I really wanted to make one of the "pop" which I think I did by coloring it in the blue/turquoise. here is a close up of the image!...so pretty.. I really did enjoy all the coloring and after getting started it really didn't take that long.I stamped it in black and colored with Prismacolor colored pencils and OMS.Very simple. Since the image was so colorful I wanted to make a very simple card, so I just used a premade dark blue card base and a simple piece of white satin ribbon doubled for a tiny bit of texture. If you haven't stopped into Eureka Stamps recently..you really should! 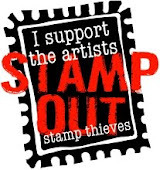 You can find this fantastic stamp there with tons more to make some fantastic pieces of art! I hope you enjoyed my card today, and please check back to see what the other talented Design Team members have for you! When I was making this Snowman card last week - about the only snowman I've seen in this strange winter - I had some blue, white, and silver plaid ribbon that I thought would make a really nice blue and white card. The snowman is so charming, he doesn't need any coloring. But then I decided to just add a little color by doing paper piecing with the scarf (using a red marker every other panel). Oh, and wouldn't it be great to do the hat in with black glossy cardstock? And by the time I had embossed the hat portion of the image, it seemed obvious I should continue with the rest of the snowman "parts". 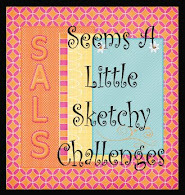 How glad I am that I went that direction when I saw Ceal's snowman on the blog! So, now you have two very different ideas of how the same adorable stamp can be used! I am a word person, so I put this greeting of blessings underneath, backed with a scrap of the same paper used for the scarf. I thought I would share a cute kitty card with you today using the Balloon Kitty Stamp from Eureka Stamps. This super cute image is available in 2 sizes as well as digi format! I used the larger one, stamped it off and colored with watercolor crayons. I trimmed it down, and layered onto some PPs from Echo Park. I added some purple ribbon, and a sticker for the sentiment. Well that is all for now...have a fantastic Monday! HI there! I hope you are having a wonderful Monday. 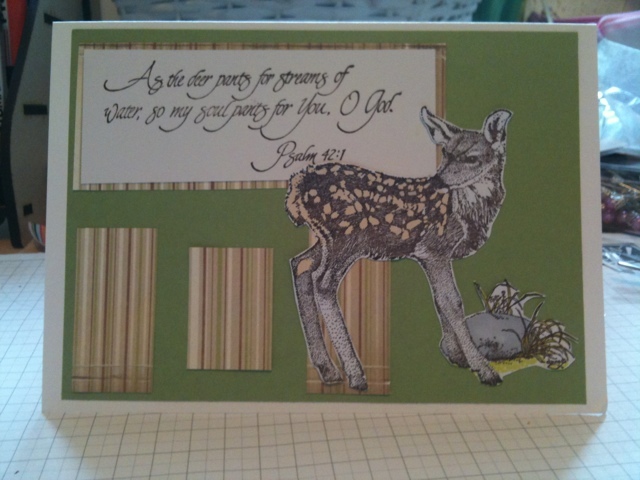 Today I wanted to share a very CAS card I made for using the Balloons stamp from Biblical Impressions. Since we celebrated my middle DD's birthday yesterday, I thought it would be fun to make a birthday card. I stamped the image and colored with watercolor crayons. I used my CM cutting system to cut the oval. I also cut and oval from the purple PP from Echo Park. I layered onto a purple CS base, and used the Happy Birthday stamp from BI along the bottom. Like I said...very CAS, but I thought it was cute for a kids party card. And today its my turn to spread a little QKR love and inspiration. Who has been placed on a very simple but entertaining background using papers from Crate Paper Neighbourhood and because these are such a busy design I kept the embellishments really simple, just a ribbon accent with matching bow. Thanks for looking in today ! Hey everyone! This is Molly from Miss Molly Creations - How are you today? A Moose - How fitting for our new life in Alaska? 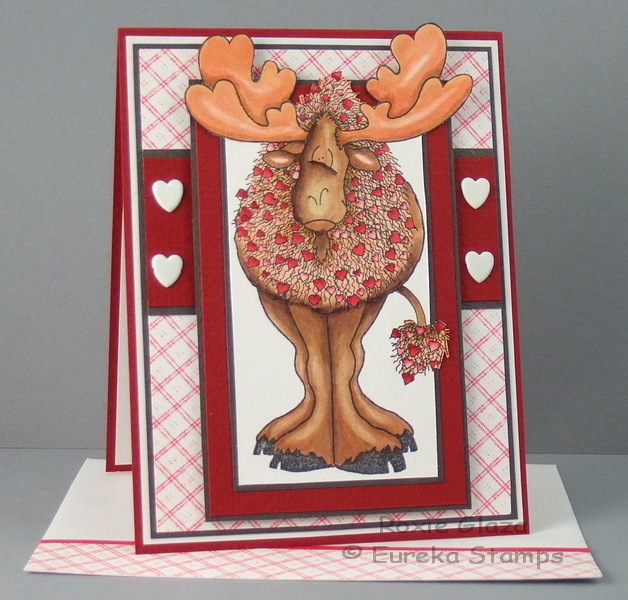 Hearty Moose with your own style? I had fun using some scrap paper and tried to go some what monochromatic and manly with the browns. 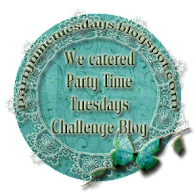 I hope you enjoyed our blog hop on Monday. This is my first post of the new year for Eureka Stamps. I am a big fan of snowmen and I found this cutie 30201 Snow Man Block, which makes a great CAS card. You could go without coloring him at all but I gave him just a touch of color on his nose, hat and buttons. I received these two gorgeous stamps In the post and the minute I saw them I knew that they needed to be used on a green and brown card. I kept this card very simple so as not to take away from the verse. Psalms is one of my favourite books of the bible. And this is by far one of my most favourite verses. I listened to our songsters singing this only the other week. Have had three friends post this as their Facebook status update so it's clear God is trying to get me to hear Him. I hope you like this card I am making a few more with this stamp today as its really got me thinking. 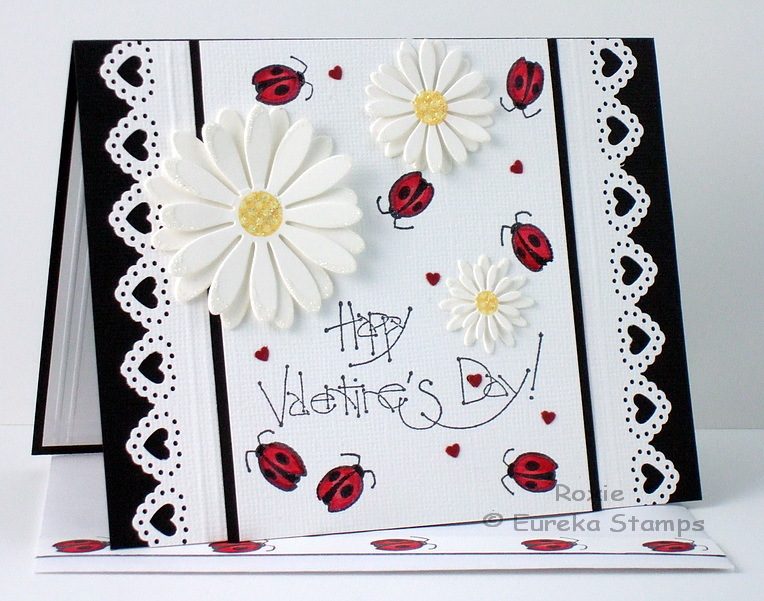 Hi, Roxie here, I'm using Eureka Stamps images today and repurposed images which can be used year round to create a cheerful Valentine. The ladybugs were stamped and colored with Copic markers. The tiny hearts were punched out and glued to the card. The daisies are packaged precut images that I glued to the card with Aleene's tacky glue and then added Stickles to the center. A Martha Stewart punch was used for the borders then I embossed two lines using the Scor-Pal before adding the image panel with black border. 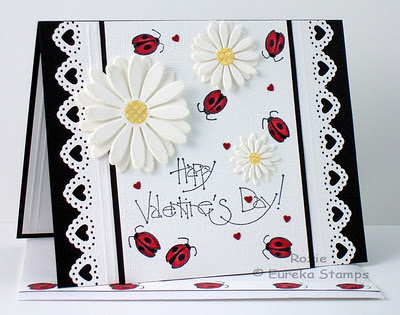 For the envelope I cut a strip of cardstock, stamped the ladybugs and colored, attached to the card and ran a line of black along the edge using a Marvy fine tip marker. It is also embossed using the Scor-Pal. For the insert I scored double lines along each edge. Do you realize that Valentine's Day is just a little over a month away? Have you started you cards yet? Do you usually make Valentine's? Love You (#10301) from QKR Stampede. This image can easily be used as a Valentine or for any occasion when you just want to say I Love You! The image comes in 3 parts. I cut the 3 components apart and use them separately. 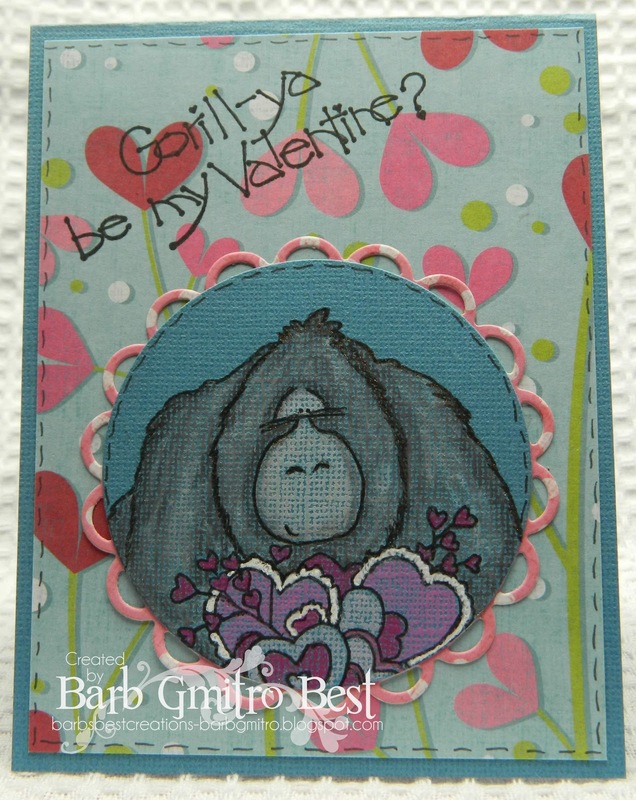 The sentiment is stamped directly on the white card stock, the rag doll is stamped onto another piece of white card stock and colored with water color crayons. 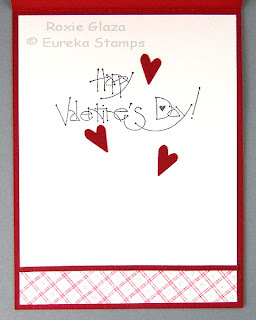 The heart is stamped 3 times onto red card stock. I fussy cut the doll and the hearts. The doll is adhered with foam tape as well as the heart she is holding. The others are adhered with glue dots. I pierced each heart and the letters above with a paper piercer and used 'baker's twine' that I made to "hang" the hearts. Thank you for stopping by today, I hope you have enjoyed this card and will come back soon and see what our design team has to show you. 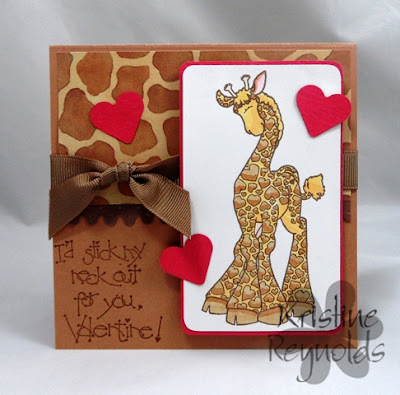 Now why not pop into the QKR Stampede shop and see what you can find to make your Valentine's Day cards with. Or, for that matter any other cards, there are a lot of great images there. Leave us a comment and let us know what you plan to do for Valentines this year and what you think of this card. Good Morning! It is Molly from Miss Molly Creations! I couldn't be happier to announce that I am a part of the Biblical Impressions Design Team! I was honored and excited as I love to use scripture on my cards and to send to people I have been praying for. I may not always come across as the typical Christian - but I do have a growing faith and love of prayer - as I know first handed it works. Here is another one of my smaller cards that I can slip into someone's book, or their pocket, or something. I like to leave them so people know I have been praying for them without trying to be thanked for it. It isn't something we should need recognition for, we should just be doing it. Have you prayed for anyone today? Eureka - Gorill-ya be Mine? 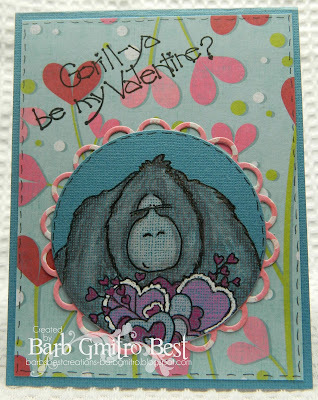 Gorilla-ya be mine and Gorilla with hearts. Too fun! I have loved this image for a while! So glad I finally have it in my hands to use! Morning folks, today is my first DT posting over at QKR Stampede and I have used this cute valentine turtle 5402 Turtle in Love on my card & coloured him using copic sketch markers. The papers used are a mix of Create Paper & Basic Grey with Kraft & Bazil Basics as matting, and to finish off I added a rather lush bow in a shade to match him. If you havent already you really need to go take a look round the stamps over at QKR Stampede, the choice is great ! I don't usually do things without color! do a monochromatic card. NO COLORING! Wow. For me - that's a first! I think it goes well with the image! Brushed Corduroy Distress ink on this card. I hope to see you back here again! When I was deciding what to create earlier tonight, I was browsing through my Eureka! Stamps and came across "Sm Ribbon Angel" (#21401) and knew this was what I wanted to work with. I have had this stamp for a while and I don't know why I haven't used it before. I ordered it because she was so beautiful and then she got buried in with my other stamps and just never got noticed. I'm so glad I found her! Guess I need a better way of organizing and storing my stamps, eh? I stamped her onto water color paper and colored her with water color crayons. I wanted a bit of sparkle, so I used some Stickles on her wings and halo. Every angel needs a bit of sparkle don't you think?!?! To add a bit more sparkle I layered the image onto blue glitter paper then onto a white card base. I thought this card went right along with the Eureka Blog Hop theme this month of "Love" What signifies love more than an angel? I plan to send this card to a friend who has been there for me through some very tough times. I will write inside "You're an Angel!" I do believe that some people in our lives are our guardian angels, there to be with us through thick and thin. Thank you for stopping by today. I hope you like this card as much as I do. There are many beautiful angel images in the Eureka! Stamp store so if there is an angel in your life, check them out and let your angel know that she/he is appreciated. Hello All! Molly here from Miss Molly Creations! I am so happy to tell you that I am also a member of the QKR Stampede Design Team! They have some of the most adorable and lovable stamps you could ever find! And how could you not smile when you see him with open arms? I keep these types of notes small just because I know Nick doesn't want anything he can't put in a pocket. I also know that he is not the type to appreciate the ribbon, brads, and fancy things that can be used. I just let him know I love him and keep it simple. It's the second Monday of the month and that means that it's time for our first Eureka Blog Hop of the year! These fabulous ladies are creating all month long so be sure and stop by our blog often to check out their latest project. Like us on Facebook and get updates every time a new project is posted! Here's a quick card to get the hop started! I used "Stick My Neck Out" and "Valentine Giraffe". Now go check out some more "LOVE"ly inspiration!